Kidnappers run into trouble when attempting to abduct a child with supernatural abilities. 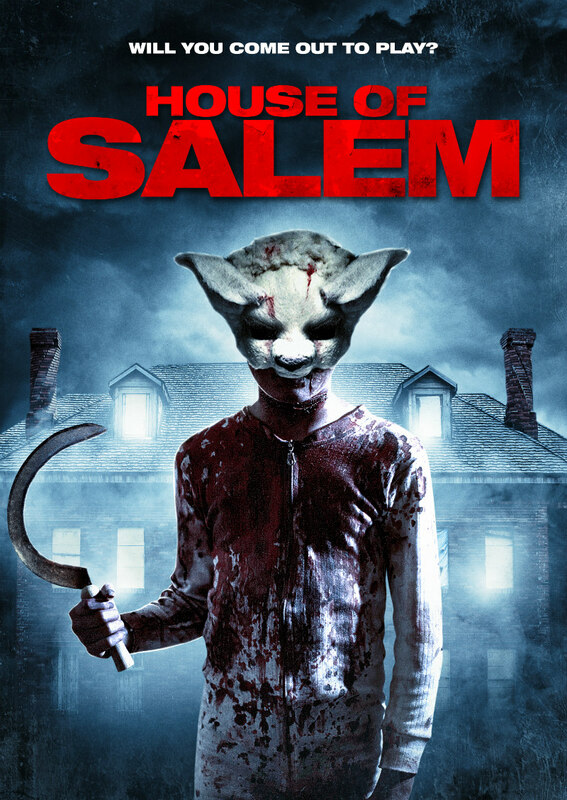 Salem is a place that is rich with supernatural and satanic history; its name, when placed in a movie title, evokes certain expectations and images - cloaked figures chanting, sacrifices, evocations of a certain red horned fellow - and happily, House of Salem mostly delivers on those expectations. It opens with a 12-year-old boy, Josh (Liam Kelly), and his button-eyed teddy lamb (fantastically named St. Peter), who are getting ready for bed. His nanny tells him to take his tablets or he will have nightmares but he fakes it and secretes them under his pillow. His dreams show him masked figures and a child’s voice telling him to "Hide; they’re in the house." The voice is right, as a clown-masked figure is next seen stalking the boy, who’s now hiding under his bed. More masked intruders appear and what seemed to be a supernatural reenactment of his nightmare turns out to be a far more basic home invasion and kidnapping. The kidnappers claim they are taking him to a ‘safe house’ as he is ‘special’, however once we are in the safe house it appears there is a deeper conspiracy at work and it may not be the simple kidnaping story we had been led to expect. Josh warms to one of his kidnappers, Nancy, and tells her that he can hear other children in the house, though she assures him he is the only one and is in no real danger, despite how scary the lead kidnapper (Jacob - Nancy’s gruff father) appears to him. The kidnappers are rounded out with Jack (young, good looking and over his head), Mickey (the loose cannon) and Craig (the muscle). It seems Josh is a very special child indeed, and, like Haley Joel Osment, he can see dead people. Nancy shares her origin story with Josh, and it's beyond dark - a future prequel perhaps?! After feeling that something ‘just isn’t right’ with the job of babysitting Josh in that big old safe house, Jack snoops and finds a trunk of VHS tapes that are labelled with children’s names and ages; it seems ominous but no one has VHS anymore so they have no idea what they have stumbled into. Before long the gang is fighting among themselves; things escalate and tensions mount with poor Josh slap bang in the middle of it. Some innocent bystanders are pulled into the story and pay the ultimate price; but revenge is sweet and nicely played out here. A betrayal occurs swiftly, followed by more betrayals and it seems everyone is not whom they first appeared to be. There are a series of scenes from within coffin-like crates that are creepy and disturbing; but the ending is unfortunately a bit of a mess. Once we have a table populated with child zombies (?) it becomes a bit difficult to follow the plot; there is a death where it’s unclear who actually dies except by process of elimination - who’s no longer standing? Are we meant to know the scarred woman? Who is that body in front of the businessman? Why is the businessman not there for the pay off? And how on earth did that escape happen?? Luckily the final few minutes are chilling and effective so previous plot holes and stumbles are almost forgiven. There are some scripting issues, such as having young Josh sing a strange little song that is eerie but never really explained, or the writing on the window ‘The devil wants to play’ – whose blood is that? Who wrote it and why? Luckily however, there is much to admire here: the time taken to get to know the kidnappers and give each of them distinctive personalities; the bond developed between Josh and Nancy and the bond between Nancy and Jack are both allowed to flourish naturally, and this adds to the later tension - you believe these people actually do care for each other. The creepy scenes are mostly successful and work well; the direction by writer/director James Crow is assured and for the most part shows a nice amount of restraint and intelligence; and I really enjoyed the many uses of masks throughout the film. The acting by all is above expected, with Jessica Arterton as Nancy, Jack Brett Anderson as Jack and Leslie Mills as Jacob particular stand outs. After watching this film I looked up the director to find if he’d made any other films - he has, and I may watch that film too; but from the strength of House of Salem alone, I think he’s someone to expect big things from in the future. House of Salem is on VOD January 23rd.